Grafh (Philip Bernard) hails from Jamaica, Queens, New York. He started just like any other up and coming rapper. But he kept on going making a name for himself in the mixtape circuit and getting record deals with Sony, Rockafella Records, E1 Music, and Sony Red. For now though, Grafh remains an independent artist (big kudos), navigating the music industry like a pro it seems. Grafh’s songs, so far, have been featured on HBO’s Entourage, Fox’s Meth and Red, and Ultimate Hustler on BET. I hope you can already stop the pattern here. Yes, his music moves with the ages. It’s true hiphop of the times; dark, emotional, but chill enough to rock to in the background. But don’t worry the real Grafh is still there, in the beats, in the lyrics, in the style. 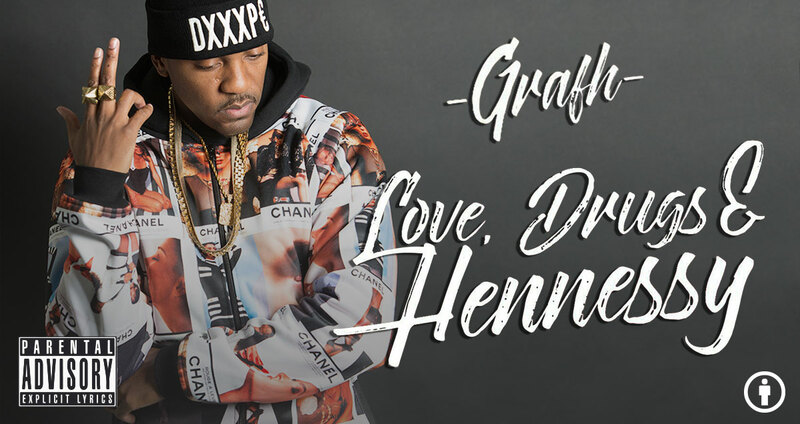 As stated by the artist – “Love, Drugs & Hennessy” was a mixtape initially created for the ladies, although, as he later adds, “it’s something cool & chill to vibe too. Hope y’all enjoy.” Even though the lyrics might be directed more toward women, the albums will hit a soft spot with just about anyone.